Fun Party and Activity Center! Private Party Packages - 3 Signature activities to make Selfie Party Fun&apos;s private party unique and fun! 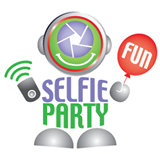 Photo Booth Rental Service by Selfie Party Fun!